We’ve had the box office returns, we’ve collated the feedback forms, we’ve paid all our suppliers and contributors and we’ve drafted a report to our sponsors. 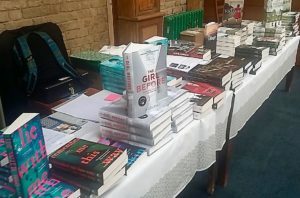 Time to take stock and consider the results of the 2017 edition of the Clapham Book Festival. It was a great success. 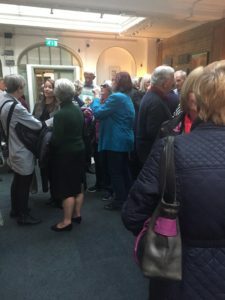 Over two hundred people came to listen and talk about books on one afternoon and early evening in May in south London and the venue was full to bursting (extra seats had to be placed at the front of the theatre). Yet again, the quality of the product was high, with 98% positive or very positive feedback from the audience (the 2% was mainly about ticketing). The finances are sound, we didn’t make a profit (that’s not what it was about ) but we didn’t make a loss either. The sponsorship money enabled the Festival to be more professional and we now have a re-usable promotional materials, a web-site, an e-mail account and a ready made audience in Instagram, Twitter and Facebook followers. We exceeded all our targets. Partners have benefited commercially and trade was brought to the hospitality businesses in Clapham Old Town. Again, more Clapham writers have been brought together and the Festival has extended its membership and address list. That’s the good side, but, as always, there are some lessons to be learned too, some of them listed below, (some from the feedback sheets provided to the audiences). More volunteers are needed. In retrospect, the organisation was too much for the small central team ( though we had more volunteers on the day ). It needs to be easier for festival goers to buy tickets and buy one Fest-wide ticket. 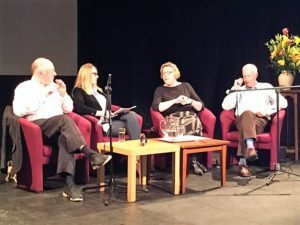 The Library and others local arts organisations should be engaged earlier in the process and the appeal of the Festival should be widened if possible (both performers and audience were very white, middle aged and middle class). Festival-goers will be pleased to learn, however, that the central team is already planning for Clapham Book Fest 2018, setting up more formal structures and governance and seeking charitable status. Our partners have asked us to continue too (let’s hope our sponsors do likewise, their Board met a few weeks ago ). As for the authors who appeared – Sabine Durrant’s Lie With Me has been short-listed for the Theakston’s Crime Novel of the Year and Andrew Lownie’s Stalin’s Englishman is The Times Biography of the Year. Meanwhile, Rick Stroud’s Lonely Courage wowed audiences at the Hay festival and AnneMarie Neary’s The Orphans is officially launched on 19th July ( at La Baita on the Common, I’m going along ) and we await Simon Bershon’s Woman of State. Just as in 2016 the Clapham Book Festival brought first rate writers, many of them local, together for a Clapham audience to enjoy. How are we going to top that next year? Not sure yet. Watch this space….. This entry was posted in Culture Vulture, London and tagged London by juliej. Bookmark the permalink.